Calling would-be astronauts and space travellers! Join us as we take you on a journey through space right here in the heart of Dubai. From 21st March to 20th April BurJuman will transport you on an intergalactic adventure beyond your wildest dreams! 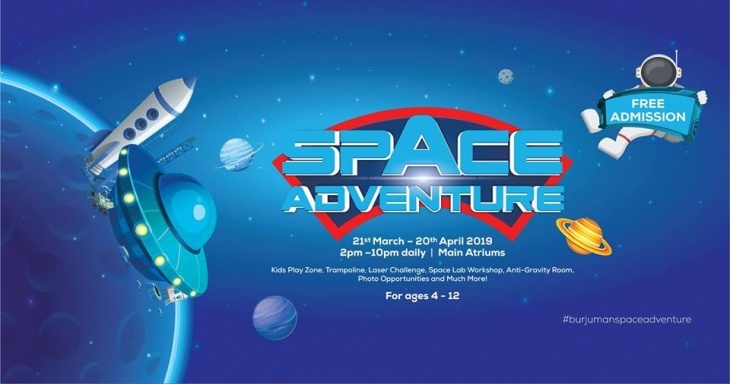 Take an orbit around the stars and planets, moonwalk through the 3D space tunnel and experience the wonder of weightlessness on the trampoline at the no gravity zone. Accept the laser challenge and explore your creativity at the Space Lab. If all this isn’t enough to fuel your rocket for take-off, the anti-gravity room is sure to turn your world upside down, and there will be other of out of this world photo opportunities!